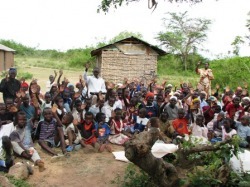 The Milimani orphans development group is one of the more recently founded of the groups we work with. But you would never know. Milimani immediately impressed us with the way in which they were going about supporting their children. They are one of the few groups we have come across to actively lobby for resources. The group has also, despite its young age, been involved in farming and poultry-keeping to help them care for the vulnerable children in their community. Towards the end of 2008, Milimani submitted a proposal to WVP Kenya asking for a marquee and chairs set o hire out in the local community and a goat for each of the children they are supporting. Having complete confidence in their ability to run these activities, we were happy to provide them with these items. As they are supporting 76 children at the time we started working with them, this meant buying a lot of goats! The group have taken to managing the hiring out of their marquee and chairs like the proverbial duck to water, and have been supporting their many children through the money they have been making from this. It is not every day you come across an all-lobbying, all-farming, and all-marquee-and-chair-hiring group - and we are certainly glad we came across this group.